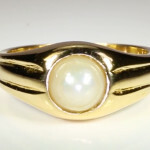 A very fine quality Real salt water pearl set in a bespoke design single piece gold casted ring without any joint. This ring is an absolute must for natives with rising signs or Lagan of Cancer, Libra, Scorpio & Pisces as their life stone towards achieving health, stability, defence from any crisis, name, fame, establishment, peace of mind, mental strength, family happiness, comforts, professional status, prestige, career, honour, flow of income, wealth, savings, assets, power, authority, wisdom, common sense, creativity, appreciation, recognition, decisions, choices, source of income, resources and opportunities. It is especially important for natives who are professionally qualified, artists, creative knowledgeable people, skill holders and professional consultants. Try this Ring and you will surely ”Discover the Difference” and experience the highest benchmarked quality standard in the industry.